I’m still working on the Imogene Training Recap (detailing my thoughts of training for this 17.1 race over a 13,000+ foot mountain), but mostly working to tone it down so it doesn’t scream, “I HATE THIS RACE” quite as loudly because the world does not need my negative shenanigans. I’m ALMOST there. In the meantime…it was the best of times, it was the worst of times (figured with a title like that, I had to throw in a Dickens quote). Since we are doing a mountainous trail race, we have started doing our long runs on trails, and we now have 2 under our belt: the 15 miler that resulted in the camping trip last weekend, and the 12 miler that we did on Saturday. One sucked beyond my wildest imagination (that’s way overdramatic. It obviously could have been worse, but at the time I wanted to punch trail running in the face). The other one sucked considerably less to the point that I would say it was almost enjoyable. Last weekend, we did a 15 mile trail run near Lake Heron in the north central part of the state during the camping trip mentioned last week. At one point around mile 13, I almost started crying because I was so frustrated with the run. At mile 14, both of us did far more walking than running because we hit the wall and kept ramming ourselves back into it for more torture. We didn’t fuel properly for the amount of time that we were out (mostly because we didn’t think it would take 4 hours and 20 minutes to run 15 miles), a torrential downpour the night before (that we experienced from inside a tent) turned the trail into a mud run obstacle course, and sometimes the trail was more of a river. Also, aside from a 3 miler, this was the longest I’ve ever tried to run on a trail, and road running really doesn’t translate very clearly to trail running. Among the sites, a swingy bridge and a staircase up the hill (going down was fun, but going back up at mile 12 killed my spirit). We also found a fresh track that I’m convinced was either a bob cat or mountain lion. Because what better way to end a bad run than with a mauling? Climbing back up these stairs was the worst. I really have not loved training for this race, but this run made me seriously regret signing up for Imogene. I’ve never considered quitting, but I did feel overwhelmed and unprepared to jump into something so different. It’s not like ambulances are readily available at the top of mountains. This run was also what convinced Aaron that I needed to forgo most other speed workouts and easy runs and focus on getting my body accustomed to trail running. I don’t have the stabilizer muscles developed to glide effortlessly through frequent obstacles and changes in direction. I don’t have the confidence in my step to not tip toe around every rock and tree root And I don’t have faith in myself to get up the damn mountain without an emotional breakdown. All of that needs to be fixed in the next 4 weeks. This past Saturday, we had 12 miles on the schedule, so we headed up to Santa Fe to run a trail that ends up at the Santa Fe Baldy Peak (second highest point in the state). Our run started at 10,000 feet and worked its way up to 11,600 (you could go even higher but we didn’t). This trail was gorgeous from beginning to end with majestic pine trees and whimsical mushrooms (perfect for gnome houses) and babbling streams! And it wasn’t muddy which made things much easier. Aaron also let me in on a secret training method that really helped my approach: WALK. So simple, yet so scary. I have never walked during a race. (I did stop to use the bathroom during Chicago, but I figure that’s kind of different). In my mind, walking equates giving up, so I don’t do it (I know that is a big fat lie). Half the time, when attempting to run up a steep hill while navigating trail obstacles, I am going about as fast as I would if I were walking, but using more energy (running is a really inefficient way of getting around). So why would I waste more energy going just as fast (or slower)? IT MAKES NO SENSE. So, with that in mind, anytime I noticed my pace dropping on the uphill, I walked until I could feel my legs relax, and then I’d run again. A lot of times this meant running for about 30 seconds and walking for about 30 seconds. I don’t think I actually ran a full mile in the 12 that we did, but I felt great, and even the high elevation really didn’t kill me in ways that I thought it would. We did bring more fuel (this is important), and the trail was in better condition, but overall I felt so much better on this run than I did on the 15 miler. I’m still not completely confident about my race performance though. We have 2 long runs left before we taper down, and I’m hoping that both of those will help my body get even stronger. But, aside from the misery and the extreme slowness, how beautiful is trail running? A good portion of our 12 miler time was spent standing at the tree line, swooning over the amazing world around us. I’ve had some amazing runs this year with some incredible scenery, but nothing quite matches the feeling of standing so high above the world and knowing your little tired (and thoroughly harassed) legs have actually carried you up there. And having every hiker (who were all amazingly friendly) stop to comment about how badass you are for running this trail is pretty dang cool. 1. Even though I can sustain myself on 1 ClifShot during a regular 15 mile run, trail running takes a lot longer and requires different fueling needs. Having a sufficient fuel stash ready will help make those last few miles much less terrible. Also, low glycogen levels actually spin your emotions out of control, so not fueling properly might actually make you cry. 2. Walking is cool, especially if you are going the same speed that you would be while running. And walking uses less energy while allowing for a bit of recovery. 4. Mantras are just as helpfult, but for me, they need to be a bit different. “BE THE GOAT” is what seems to be working to get me up the hills, but it wouldn’t make any sense sprinting down a city street. 5. CORE STRENGTH and strong quads: These are always a big deal for runners, but when you are going down a steep downhill stretch, gravity will throw you off the mountain if you don’t have a fine tuned brake system. I’ve had more scares than I care to admit. Trail Running: Love it or hate it? Favorite trail running shoes? I’m likely going to go with the Brooks Cascadia, but I could use suggestions for a more supported trail shoe. Yay, I love trail running. Don’t feel bad or guilty about walking at any time during a trail run. Everybody does it, even the elites. You’re right on, running up hill exerts more energy, and you’ll need it! Good luck! Hi Kristy! Thanks you! It will absolutely take some reprogramming to get me completely comfortable with walking during races, but I know if I don’t, I will probably be worse off for it! I love trail running in Pasadena but to be completely clear…I am not climbing mountains at elevation and my total elevation climb for 6 mile run is probably around 300-400 feet. I am not sure I would like this type of trail running! Seriously though, I am glad to see you got out in elevation to train, that would be my biggest fear…so thin. From blogs that I have read, good times at races like these are usually double what a road race would be…which tells me there is a lot of walking. I completely understand not wanting to walk on a road but this is a new world, thankfully A let you in on the secret! As for the calves and quads, get those strong, I killed my muscles on a road because I didn’t train enough incline for RAGNAR, you guys are on mountains. You guys are badasses for sure. I am excited for you guys. I use the Saucony TR 2, but it is a minimalist style shoe with added traction. I love it because I am forced to run springy (if you know what I mean) and I feel light. If you have dirt and rocks, they get the job done, There is minimal support around the ankle, arch or cushioning but my feet feel great, better than on the road. I had some supportive Solomons (that had ankle, arch, and cushion) and I felt less safe with those than the TR2 due to the bulk. It’s kind of sad that I felt that I needed permission from someone to walk, but it really did change everything for me. I have 2 weeks to try and figure out a good balance between walking/running though. I don’t want to walk more than I should be. I love being springy! I probably won’t be able to do minimalist just because that isn’t what I wear normally, and I pronate way too much. Aaron is even thinking I might need to get insoles for the Cascadia. We’ll see. It’s my project for the next couple of days. Thanks for mini review! I love trail running and hope to get into doing more of it. I think you are doing great for never having run much on trails. I can’t speak for the entire race, but I have run the Telluride portion from Tomboy down into town and it is on a dirt road, so at least the latter portion of the race isn’t on a very technical trail. You’re going to do awesome! Thank you for the pep talk! I think the uncertainty of the whole thing is really messing with my head! I’ve heard that most of the trail is actually pretty well worn without a lot of obstacles aside from the top portions, so I’m looking forward to (hopefully) racing on a trail much easier than the ones I’ve been training on! I just went through a ton of out-of-your-comfort-zone training for the 50-miler I have in 10 days and had very similar thoughts. It’s a different beast, it takes so much more out of you than a marathon does, and the food requirements are off the charts. Here’s to hoping I don’t hate myself TOO MUCH on August 24. Best of luck on September 7! Thank you! And GOOD LUCK TO YOU! I’m having a hard time imagining this for 17.1 miles…50 just sounds…scary. I’m sure you’ll do great though! To go from a 3 mile trail run to 15 muddy miles with STAIRS – no wonder you hated that run! But you gained so much valuable information. Mud and stairs, along with giant roots, rocks, and sand are probably my least favorite things about trail running. My favorite things are the views and the feeling you get when you’re running down single track with no one else in sight. After 2 more long runs under your belt, I think you’ll be in much better shape for Imogene. And remember that hills are speedwork in disguise, so don’t worry about losing speed as a result of all of this trail running. I’ll be interested to hear what you think about my trail racing post (going up tomorrow!). Hope it’s helpful!! Though I should really add the part about walking — it’s definitely the key to successful trail racing! The stairs were so terrible…I think there were about 50 of them (those wide ones, and then a flight of regular ones that takes you up to the bridge where I’m looking down in the picture). Especially on the wide ones, I had to talk myself into climbing each one. But yes, beautiful scenery! I’m actually curious to see if I’m back to my Boston (or even Chicago…) speeds when I go back to road running after this race. I have no doubt that you will be speedy! I just ran a 10K at 8:31 pace (4 min PR) even though I was doing nothing but 10:30/mile paces on flat road and 12:00/mile paces on trails! Walking is just part of it. All the cool kids are doing it, so no worries of someone rolling their eyes as they mountain goat their way up the hill past you. Seriously, it’s all good. When I switched to longer distances and on the trails, I switched to going by time rather than distance (3 hour long run as opposed to a set amount of mileage). Food is always tricky, especially out on the trails but that is what your training is for. I do find that I prefer real food after being out for a while but always just do what works for your body. We actually switched up to real food on the 12 mile run, and I think that contributed to the overall less miserable disposition. Apparently this particular race has pretty swanky aid stations with lots of snacks, so we are training with more stuff like that. i’ve never really ventured into trail running, but i have definitely hit the wall and started crying on long runs! hang in there, it happens to us all! Hate the wall! I think I’ve really hit it 3 times, but this was the worst! It IS so much nicer to run with fresh air and fresh scenery. I also imagine all of your bike riding is helping build quad strength! You live in the perfect area for trail running! I haven’t done much at all- and no trail races. But I’m excited for you!! Trail running really is a “‘thing” here! I guess we’ll see how this race goes before I think about doing more, but it has made me value long runs that don’t take 4.5 hours! 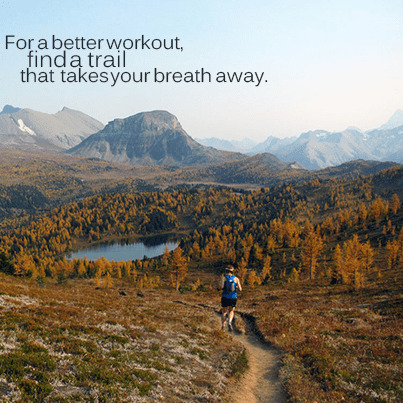 I totally love trails – and trail racing! It is definitely a run-by-effort thing rather than run-by-pace. When I have to walk, I just tell myself that the best mountain runners in the world walk too. Every climb has a downhill, and that is where you can let fly! Hi Sherry! Thank you for stopping by! I think you’ve helped me come up with a new trail mantra: every climb has a downhill! Thanks! We don’t have great trails here in the midwest (or I haven’t found them yet), so I definitely need to plan some trips out west! That looks like one tough workout! Come on over! Based on my experience with the midwest, it looks like a lot of flatness! It is definitely a tough workout. It has taken a couple of months for me to feel like I’m getting used to it. Question: during your marathon, did you run the entire time?? Like even through aid stations, run and drinking water?? I used to have the same mindset, thinking that if I walked even for 5 seconds, it was kinda like quitting, even though I knew that was not true! I mean plenty of people who walk off and on are way faster than me. Recently I started walking through aid stations and with the time to stop, walk, drink my water and then continue (instead of choking on my water while running) my race times dramatically decreased. IT was awesome. Yup! I run even through aid stations (I do slow down considerably though). For me, I have a much easier time staying at a consistent pace. When I slow down or start walking, the start up seems to take more effort, and it takes me a few minutes to get back into a groove, and I’ve also found that the people who stop to walk generally get trampled on, at least in the bigger races! I do think there is a huge difference in walking the aid stations vs. stopping mid-course to catch your breath or recover. I don’t even know if I would consider walking the aid stations to be “walking” during a race because it really serves a reasonable purpose (not spilling water all over yourself! ).